Lee and Tiong (third and fourth left, respectively) jointly unveil the banner board to mark the grand opening of Nu Hotel Bintulu. BINTULU: Samalaju provides the impetus to the growth and development of this town, of which the current population comprises people from all over Sarawak and outside the state. Chief Minister Datuk Amar Abang Johari Tun Openg said it was fortunate for this town to be close to Samalaju – the source of price-effective hydropower. “This feature boosts the growth of Bintulu as a bustling industrial town. Having more industries means higher manpower is required by these industries; more people means more housing units and hotels; more people means more food to feed the people,” he said in a speech at the grand opening of Nu Hotel Bintulu yesterday. Abang Johari noted that the spin-off effects for the local economy has been tremendous, in that they bring positives changes to the livelihood of the locals – including the ordinary farmers and fishermen. “The rapid economic growth in Bintulu is reflected by the emergence of many new commercial and housing areas, as well as the opening of new hotels, fast-food chains, supermarkets, entertainment outlets and various shops. “New houses are constructed at the uptown areas to cater to the housing needs of the increasing population,” said the chief minister, whose text of speech was read by Assistant Minister for Tourism Datuk Lee Kim Shin. 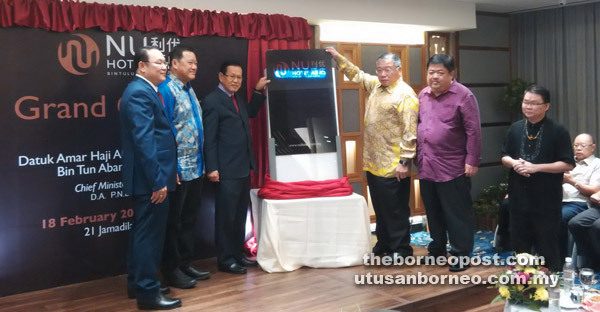 The ceremony yesterday was witnessed by Bintulu MP Datuk Seri Tiong King Sing, Bintulu Development Authority (BDA) general manager Rodziah Morshidi, Nu Hotel Bintulu manager Seamus Lee and local heads of government departments. Abang Johari also observed that the tremendous population growth here, coupled with the rising purchasing power of the people had contributed to the recent boom in the local food and retail industries. On the new hotel, the chief minister congratulated the owner Rich Million Corporation Sdn Bhd – a company that began from a humble beginning and had grown into becoming a prominent name in the supermarket business, cold storage operations, as well as automation and transportation, hardware and food industries. “Today marks a new milestone (for Rich Million Corp) with the opening of its first hospitality asset. The success of our homegrown companies that help keep our domestic economy going, is really something cheer about. Other companies should emulate them (Rich Million Corp), particularly in setting up SMEs (small and medium enterprises),” he said. According to Abang Johari, SME remains the mainstay of economies such as Taiwan, China and Hong Kong and this sector must be encouraged in Sarawak, especially for the food industry. “The food industry in Sarawak has a lot of potential that we must exploit wisely,” he said. Abang Johari stressed that being an industrial hub did not mean that Bintulu could not be a clean, ‘green’ and beautiful town and on this note, he commended BDA under Rodziah’s leadership for its efforts in upgrading the streets and roads here, as well as clearing the five-foot ways from becoming haphazard trading areas. “Of course, BDA cannot do it along, without the support from the people. Bintulu is your town and everyone is duty-bound to make it great,” he said. On other developments, Johari said Datuk Patinggi Tan Sri Adenan Satem had done so many things for the good of Sarawak and its people over his short tenure of two years and 10 months as chief minister. Adenan, the state’s fifth chief minister, passed away on Jan 11 this years due to heart complications. “He (Adenan) had steered the state Barisan Nasional (BN)-led government to a landslide victory in the last state election, winning 72 out of the 82 seats. He had asked for five more years to continue being the chief minister after that election, but had only reached the eighth month into his new term when he passed away. “No doubt, Datuk Patinggi Adenan was a great leader loved by all Sarawakians and non-Sarawakians,” he said. As a new captain of ‘Team Adenan’, Abang Johari reassured all that this team would uphold Adenan’s legacy and follow up on all the policies that he (Adenan) had laid down. One of which, said Abang Johari, would be the negotiations with the federal government on the devolution of power back to Sarawak and also with Petronas. “We thank the prime minister (Datuk Seri Najib Tun Razak) for being gracious enough to say that he would listen and give back to us whatever that had been taken inadvertently. “We trust him and the discussions between Putrajaya and Petra Jaya will be carried out in a friendly and diplomatic manner,” said Abang Johari.